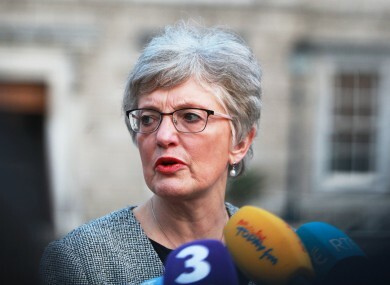 THE COALITION OF Mother and Baby Home Survivors (CMABS) has said that it “utterly rejects” Minister Katherine Zappone’s refusal to offer redress to survivors of these homes. Measures of redress were recommended in the second interim report by the Commission on Mother and Baby Homes, published yesterday. In a statement, the government said it had “carefully examined the Commission’s recommendation regarding redress, and has concluded that it is not possible to implement it”. Minister Zappone said that she had “consulted in great detail with the Taoiseach, the Attorney General and other Ministers” before this conclusion was reached. CMABS said this failure to provide redress was “immoral, repulsive and cold-hearted” and all it does is “kick the can down the road waiting for more and more elderly survivors to die”. The report, which can be read in full here, says that it is “clear that children who were resident” at the mother and baby homes under its investigation “have a real cause for grievance” at being left out of any redress scheme. While the report does not assert that abuse occurred at these institutions, “as its investigation is still far from complete”, it does say that children who were resident at these homes were in the same position as the children in industrial schools and orphanages covered by previous redress schemes. Logically, children who were resident in the named mother and baby homes and all county homes should be eligible to apply for redress in the same way and under the same conditions. Speaking today, Zappone said that the survivors would have to “go through a process of proving abuse in order to access that [redress] scheme” because the Commission has not yet provided findings that abuse occurred at these homes. “If they do suggest that there are findings of abuse and make recommendations in terms of redress, then we will deal with that then,” she said. Previous redress schemes have cost the government billions but Zappone did not rule out the possibility of redress once the Commission completes its full report. “It is true that the other redress scheme was extremely costly,” she said. If there are various bodies responsible other than the State, it’s important to ensure that whoever is liable and responsible shares the cost. Sinn Féin TD Donnchadh Ó Laoghaire said that it was “deeply disappointing” and “insulting to survivors” that a redress scheme wasn’t being pursued by government at this time. The report is dated 16 September 2016, and CMABS was also critical of the time it took for the government to publish the report, calling it a “national disgrace” and a “shameful decision”. Fianna Fáil spokesperson on children and youth affairs, Anne Rabbitte, also expressed “grave concerns about the length of time it has taken to see this report published”. Zappone concluded that space and time must be given to the Commission to complete its full investigation, and that she would “take whatever action” she could to address the issues raised in the meantime. Email “'Immoral and repulsive': Fury at Zappone's refusal for redress for mother and baby home survivors”. Feedback on “'Immoral and repulsive': Fury at Zappone's refusal for redress for mother and baby home survivors”.